Well, it seems that I have neglected to take as many pictures as I might have, but the engine has actually progressed since the last installment. 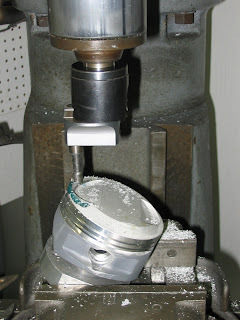 A mock up to check valve to piston clearance revealed two things. The first was that the hunk of clay I have been using for probably 20 years for this purpose, has finally become just a little too hard. I read somewhere that plumbers putty also works well for this, and since I still had some left over from a drain repair last year, I gave it a try. Didn't like it. Even with a little grease on the valves, the putty didn't want to remain stuck to the piston. Happily, a call to my lovely wife caught her in the midst of shopping - what are the chances of that? Now I am the proud new owner of 99 cents worth of fresh Chinese made modeling clay! And yes; she did look for the American made version without luck. The second thing that the mock up revealed was that the valve pockets in the pistons needed more clearance. The intake pockets were deep enough, but needed more radial clearance for the 2.125" diameter valves. A trip to the mill took care of that, but the exhaust valves were another matter entirely. Not only did they not have enough valve to piston clearance, they actually touched the piston preventing a full revolution. This is a pretty unusual situation, and as such, it was unforeseen by me. And since it was unforeseen, I had already taken material from the inside of the piston domes to lighten them. Not knowing how much material would need to be removed from the valve pockets, but knowing I did not have much to work with, I chose to sink the exhaust valves deeper instead. I started by going .080" deeper to see if that gave at least some clearance (and it did), and then went back and cut the seats again to give a finished clearance of .100". A new pair of custom exhaust valves with shorter overall length have been ordered to put the stem protrusion back into a rocker geometry friendly state. Incidentally, the exhaust pockets also needed a little more radial clearance than they came with, despite the fact that I did not increase the exhaust valve size. As I hinted at in my last post, the flywheels were cut down a fairly radical amount, making the balance trickier than usual. Normally when balancing flywheels, the counterweight section of the flywheel is the heavy spot, and one simply drills holes at the heavy spot to bring it into balance. When the flywheels start to get very narrow, the "counterweight" shrinks. With big bore pistons it is easy to come up with a situation where the "heavy" spot in balancing is on the crankpin side - not the place you want to weaken by drilling balance holes. After I had lightened the pistons as much as I felt was safe, that was still the situation I was faced with. Rather than creating a "swiss cheese" effect in the crankpin area of the flywheels, however, I used an end mill to "skim" the required weight. After multiple trips between the mill and the balance table, the flywheels came into balance with no holes drilled whatsoever. Sorry, but I neglected to take pictures. As for the rest of the motor, the inside of the crankcases (including gearcase) were treated to an oil shedding coating, as were the flywheels once the balancing was complete. Again, I neglected to take pictures. Once trued, the flywheels were installed in cases and the oil pump and gearcase assembled. As I await delivery on the custom exhaust valves, final porting work is the next order of business. The intake ports, as mentioned in a previous post, have had the floors welded up. Due to the large valve size (2.125" vs. the 2.0" the heads came with) a larger port opening size was in order. The port diameter that I chose was 1.900" (89% of the valve diameter). This of course required major modifications to the intake manifold, which included relocating the flange bolts. I will try to include some pictures when the heads are nearer completion. Fortunately the owner gave me a bit of a reprieve on finishing up this motor, which has been a real blessing since I have a boatload of other work that needs to be finished up soon, not the least of which is a motor that is headed for the great salt flats dyno in Utah. Now, with that "teaser" I had better abandon the keyboard for more productive endeavors.